You have been to class. You have taken all of the notes. You have the assignment, but you do not know where to begin. Maybe you are just having a hard time putting it all together. You need FREE TUTORING! That is where the Learning and Tutoring Center can help. All of our tutors are experts in their fields. Many of our tutors are students themselves (if not, they were at one time), so they know how to explain the solution in a way that you will be able to understand. We have a CRLA-certified Learning and Tutoring Center located on each of Perimeter College’s five campuses where we provide academic support in mathematics, reading, writing, science, and more. In addition to our face-to-face tutoring services, we provide a variety of other services and resources to accommodate student needs. Are having problems understanding class assignments. Need to improve your skills. Are preparing for the Entrance Exam. Need access to handouts or computer-based resources to help improve your skills. Are looking for a comfortable, supportive study environment that offers tutors, computers, and other instructional resources all in one location. Want to polish your resumes, cover letters, and applications. We have something for everyone. We are here to serve you. Schedule an Online Tutoring Session. The Accuplacer WRITING AND READING Skills tests are multiple-choice tests that help students determine if they have the writing and reading skills needed to succeed in standard entry-level college courses. Welcome the LTC Online Tutoring Portal! Check out or new tutoring platform! Athena Online Learning & Tutoring Platform! The OLTC is dedicated to providing the best resources possible to aid students in being successful in school. To do so, we offer multiple types of online tutoring. We have videos online for test reviews, as well as general concept help. We also hold regularly scheduled review sessions for different subjects. Check out this section to see what review sessions you can join. Our review sessions are held via WebEx. PRINT the following LTC TEAS Resources and BRING to Workshops. The Decatur Writers’ Group is a venue for the gathering of students, faculty, staff and community members who share a love of writing. Participants may bring up to 5 double-spaced pages of their creative works. At our sessions, writers share their works and members offer critiques for every stage of the writing process. Additionally, to broaden and enhance the writing experience, the group will periodically host professional guest speakers such as editors, instructors, and published authors. All meetings are FREE and open to the general public. For more information about the Decatur Writers Group, please contact us at 678-891-2334, or via email at jconaway@gsu.edu. The Learning & Tutoring Center at Perimeter College sponsors The Writers’ Circle, an ongoing group of students and community members who enjoy the writing process and seek the support and insight of fellow writers. All meetings are free and open to the public. At the sessions, writers read from works in progress and offer critiques for every stage of the writing process, from nurturing an idea into gestation to achieving its publication. To broaden and enhance the writing experience, the group also hosts guest professionals such as editors, instructors, and published authors. Please read the history of the Writers’ Circle for details about how this great group has evolved. The Writers’ Circle meets the first and third Friday of each month in Building N-LRC on the Dunwoody Campus from 1:00-3:00 p.m. in room 3100. Bring 8 copies of up to 5, double-spaced pages (any genre) for constructive feedback, or just come to listen and get writing support and inspiration. These sessions are free and open to the public. Call 770-274-5243 or e-mail nmcdaniel@gsu.edu for more information. Gelia Dolcimascolo, writing tutor at Perimeter College, Dunwoody Campus, serves as group facilitator. All applicants will need to provide a transcript of all course work and at least two references. Faculty and/or employer references are preferred. Peer tutor applicants will need two faculty references. The Learning and Tutoring Center (LTC) of Perimeter College employs tutors who have individual or group tutoring experience in writing, reading, literature, ESL, mathematics, the sciences, accounting, and economics. Tutors work with individual students or small groups, and assist with the operation of the LTC by creating learning tools and handouts, helping students and faculty access and use LTC resources, and explaining and enforcing LTC policies. The LTC employs both peer (undergraduate students at PC or another college) and professional (applicants with a bachelor’s degree or higher) tutors. Applicants are evaluated for proficiency in the appropriate discipline (math, writing, science, etc.). Peer tutors must have at least a 3.0 GPA in the subjects to be tutored and a 2.6 GPA overall, as well as a minimum of 15 semester-hour credits in college-level courses. TRIO Student Support Services (SSS) at Perimeter College seeks SSS Academic Tutor(s) to provide tutorial services/academic enrichment for SSS participants in the areas of math, science (i.e. chemistry, biology), English and reading. 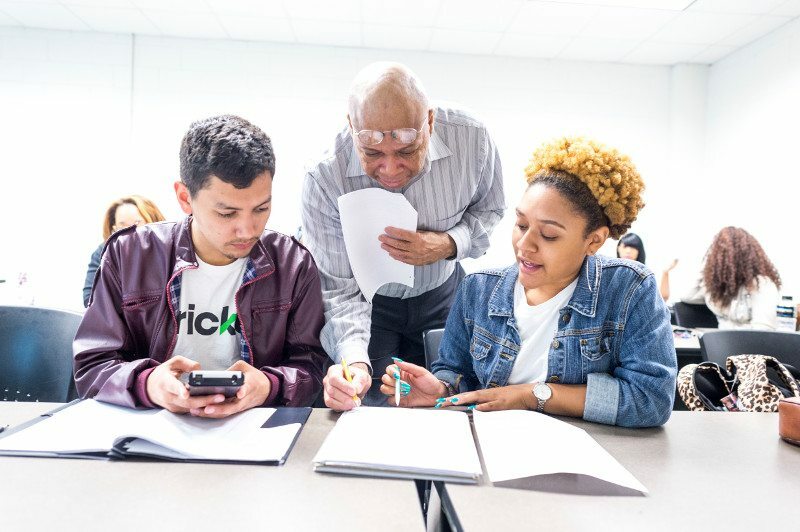 TRIO SSS program provides academic, personal, social, financial, cultural and technological services to low-income, disabled and first-generation college students. The Academic Tutor carries out TRIO Student Support Services’ plan of operation for student success as it relates to the tutorial component and the grant’s objectives. Tutors will provide direct assistance to students in reaching their academic goals as well as support to the TRIO SSS Program in its concerted efforts to increase the retention, graduation and transfer rates of first generation, low income and/or disabled college students enrolled at Perimeter College. TRIO SSS employs tutors with a bachelor’s degree in the desired area (or a closely related field) in which candidate seeks to provide tutorial assistance. Undergraduates (juniors and seniors only) with excellent preparation will be strongly considered. All applicants must have at least 15 semester hours/23 quarter hours in the area they wish to provide tutorial assistance. A minimum GPA of 3.0 in the discipline courses is required. Candidates desiring evening, afternoon, and weekend hours will be considered; however, strong preference will be given to qualified applicants who are available Mon-Fri during morning through afternoon hours. Experience working with low-income, disabled and/or first generation college students is a plus. LTC receptionists provide basic clerical support for the Center, with the goal of ensuring that visitors get the most from LTC services. Receptionists must be knowledgeable about all aspects of the LTC, so they can answer students’ questions. Only PC students with a 2.5 GPA or above in all college-level coursework are considered for the receptionist position in the LTC. The receptionist position is staffed by student assistants (must be taking at least 6 credit hours) or work-study employees. The application deadline for the fall 2018 semester is July 13.